Writing about masterpieces is always difficult, yet in the case of Patricio Guzman’s Nostalgia For The Light, it’s almost crippling. On the one hand, there is enough information and emotion contained within this film’s 90 minutes to justify several thick, glowing texts of appreciation. It’s not merely that Guzman guides us on a journey that tackles just about every grand issue known to man: astronomy, ecology, geology, history, government corruption, personal loss, memory, time. It’s that he does it with such seeming effortlessness. As a filmmaker, as a film lover, as an ordinary human being, I find the cumulative impact of what Guzman has accomplished with this profound cinematic essay to be completely staggering. As a child growing up in the peaceful, isolated country of Chile, Guzman became fascinated with outer space. Perhaps it’s because his native land gave birth to the Atacama Desert. Regarded as the driest desert in the world, the Atacama has a clear-skied climate that has consistently enabled astronomers to better study the far-off universe. Even when Chile’s innocence was shattered by the 1973 coup d’etat and subsequent dictatorial reign of General Augusto Pinochet, astronomers continued to point their eyes and minds at the planets and the stars. It’s as if astronomy has always been in Chile’s bloodstream. Guzman’s entire career as a filmmaker has been devoted to personal excavations of his country’s past. For obvious reasons, Pinochet’s murderous reign has been his primary source of torment and inspiration (The Battle of Chile, Chile, The Obstinate Memory, Salvador Allende). And though he begins this film far away from his homeland, up there in outer space, he gradually transitions back down to the ground, settling in that same desert where those astronomers’ intimidating telescopes reside. To this day, there remains a devoted group of women who sift through the earth religiously with the hopes of finding the remains of their loved ones, who were “disappeared” during the Pinochet era. For these women, their search is as infinite and unknowable as trying to explain the universe itself, only their investigation is a much sadder one. 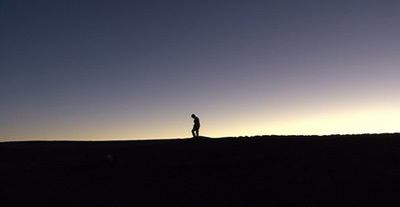 As Guzman shifts his perspective from the sky to the ground, from the present to the past, he introduces several more subjects who widen the film’s scope while retaining its air of personal intimacy: a young astronomer, an old archaeologist, a former prisoner architect, a young wife whose parents were killed under Pinochet’s dictatorship. Intelligent, eloquent, and warm-hearted, these interviewees add an even deeper layer of nobility to Guzman’s cause, enriching a project that doesn’t seem as if it could get any richer. The true gift—and mystery—of Nostalgia For The Light is how Guzman is able to cover so much ground without collapsing under the weight of so many massive ideas. Each one is presented as clearly, thoughtfully, and with as much respect as the last, and he paces the film (co-edited with Emmanuelle Joly) in such a way that it moves forward like a steady current while still providing enough room for viewers to breathe and absorb this distinguished material. Three viewings later and I’m more in awe than ever at Guzman’s accomplishment. Typically, a film only needs to succeed on one level for it to be deemed great. Patricio Guzman’s Nostalgia For The Light is a marvel on several: personal, universal, political, philosophical, historical. It’s the most generous gift you will receive at the movies this year. It is as necessary as viewing can get.